Muffin escaped from a pet sitter, and she ran loose for three days until her owner lured her to safety using Calming Signals, and singing. Singing has been helpful for many owners who were trying to recover their lost dog. The owner of a dog named Lacey was in the habit of singing Chantilly Lace to her, and when she located her and couldn’t quite get her to come, she sat with her back to Lacey, and sang her favorite song. It worked like a charm. I can’t guarantee it would work in every case, but it seems to help in some cases, and I have heard no reports that it ever made matters worse. Muffin had been seen in an area several blocks from home. People who saw Muffin wanted to help her, but their approach was making her run in panic. These Good Samaritans were not using Calming Signals, as they should have been, and every encounter made it harder to catch Muffin. The reported sightings indicated she was going into a field full of brambles and an adjacent strip of forest. The search dog had been able to follow her scent trail in certain areas, but we were not allowed to continue onto private property. Also, we were concerned that tracking Muffin into the woods might drive her deeper in, and make her harder to catch. A trap was set nearby, and spotters took up posts, in cars, near places she had been seen. When Muffin’s owner got a call that she was seen near the area of the other sightings, he hurried over, and laid eyes on her for the first time in three days. She bolted, but she didn’t go very far. The barking of neighboring dogs indicated where she was, and the owner found her again. She barked at him, which I viewed as a positive sign. At least she wasn’t running. 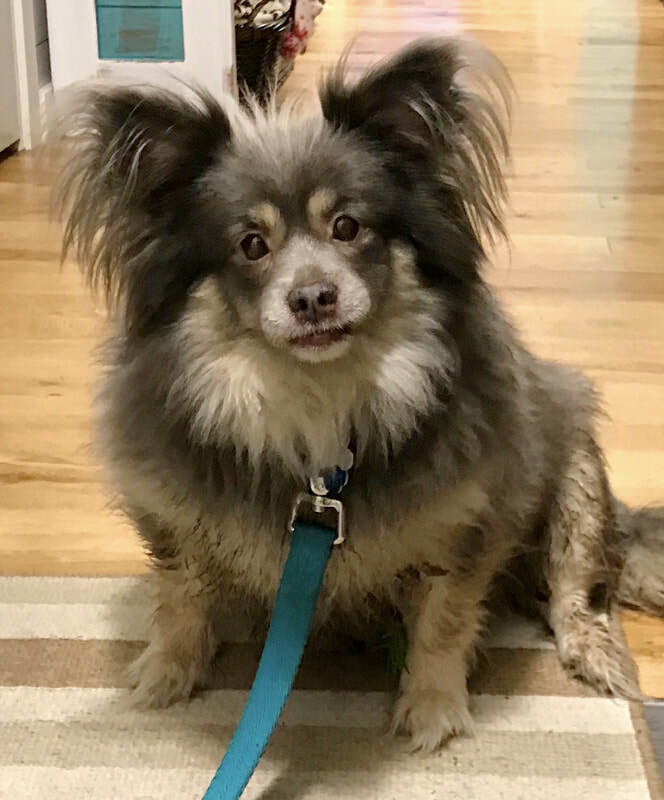 I can’t know exactly what Muffin was thinking, when she was barking, but I imagine she was saying something like, “I want to come to you, but I’m too nervous.” Muffin’s owner followed my directions and used calming signals. He sat in the middle of the road, with his back to Muffin, and let her get comfortable with his presence. Volunteers watched for traffic and were ready to divert anyone who might interfere with this process. Because we had discussed it earlier, and we knew that Doug would often sing around Muffin, I recommended he give it a try. He was singing softly, so softly that I couldn’t hear it from my vantage point, 80 feet away. It appeared to work, and Muffin gradually moved closer. I reported Muffin’s movements to Doug via text, so he wouldn’t have to look at her. In just a few minutes, she worked her way from 30 feet away, gradually closer, and then she rushed up to him and whined, saying she was ready to go home. You may want to try singing if you find yourself in a situation where your dog won’t come to you because she is frightened or panicked. Sit with your back to your dog, and use your smart phone to look over your shoulder and keep track of her movements. Sing softly, and just loud enough that she can hear you. It should be a song she is familiar with, and a gentle, simple song. Nothing by Nine Inch Nails or The Beasty Boys, unless you have your own gentle version of heavy song. Watch and see how your dog is reacting. If her first reaction is to bolt away, then stop singing. It may not work in every case. If she is sticking around, or even edging closer, then just keep singing softly and give it time to work. In most cases, it should draw the dog in within five minutes. Why would singing to a dog be effective? I don’t know, but my guess is that most people who sing are in a good mood, relaxed, and cheerful. At least, that’s when I sing. I don’t sing to a dog when she is annoying me, or when she is in trouble. I DO use my dogs’ names when they are in trouble. Tino, stop killing your sister. Sky, get off the table. Fozzie, don’t just sit there and stare at me, come over here when I call you. If you are like most dog owners, you will have used your dog’s name at a time when you weren’t completely happy with them, and your dog was being scolded or corrected. Most people, I would imagine, don’t sing at their dogs when they’ve chewed on the arm of the sofa or chased the cat again. There may be some other reason why singing works, but whatever the reason, it has been proven to work in some cases. If done right, in conjunction with Calming Signals, it at least won’t do any harm. Even if you aren’t a great singer, your dog probably thinks you have a wonderful voice. Muffin certainly seemed to like Doug’s singing.